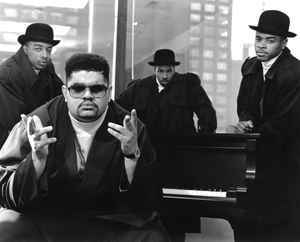 Dwight Errington Myers (Heavy D.) (deceased), Glen Parrish (G. Whiz), Edward Ferrell (DJ Eddie F), Troy Dixon (Trouble T-Roy) (deceased). Not sure who added Andrew Risper as G Whiz. But, G Wiz from "The Boyz" and Captain G Whiz (Andrew Risper) from the Mighty Mic Masters are two different people. In fact, Captain G Whiz disses G Wiz on "Go G Whiz", claiming he stole his name, "But there's something I should mention, that something is/There's a toy down with the Boyz who calls himself G Wiz/but that's my name, you can't claim it/So chump, you better change it or the first place I see your face I'mma rearrange it..."
R.I.P Heavy D just shows more needs to be done for people who fly on planes who overweight as this effects a lot people but seems not as no what matter what government is in they do not help people as they are all out for there self's.As this is certainly the way it is in the UK.But his music lives on with us all each time we all listen to him.One Geebeats.